For Signature HealthCARE, 2015 was all about continued quality enhancement, education for our caregivers and leaders, expansion to better partner with all health care providers, and setting our anchor as a culture change leader among nursing home and all health care providers. There were many highlights, but among them we managed to stage 5-star comebacks, bring residents’ dreams to life, launch a statewide clinical network and cap the year with a major acquisition, welcoming 18 new centers to the Signature family. We also won some pretty sweet awards along the way, which was icing on the cake. The past year bore its share of challenges, as they all do, but it was also a year of perseverance. Our stakeholders demonstrated that they are more dedicated than ever in our unwavering mission to revolutionize health care. And, we think, we’re getting there. 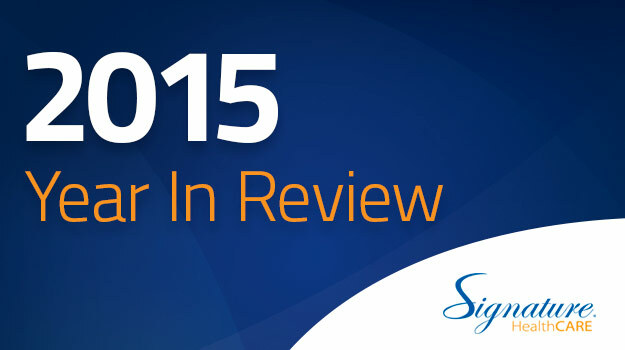 If you have a minute, take a look at our quick recap of 2015. We hope it offers just a glimpse of our hard work and intentions to better serve our residents, families and staff members.